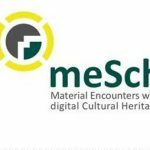 meSch, Material EncounterS with digital Cultural Heritage, has the goal of designing, developing and deploying tools for the creation of tangible interactive experiences that connect the physical experience of museums and exhibitions with relevant digital cross-media information in novel ways. A wealth of digital cultural heritage content is currently available in on-line repositories and archives, it is however accessed only in a limited way and utilised through rather static modes of delivery. meSch bridges the gap between visitors’ cultural heritage experience on-site and online by providing a platform for the creation of tangible smart exhibits, that enables heritage professionals to compose and realize physical artifacts enriched by digital content without the need for specialized technical knowledge: the platform includes an authoring environment for the composition of physical/digital narratives to be mapped to interactive artefacts, and an embedded multi-sensor digital system platform for the construction of ad-hoc physical adaptive smart objects. The meSch envisioning and realisation approach is grounded on principles of co-design, the broad participation of designers, developers and stakeholders into the process, and on a Do-It-Yourself philosophy to making and experimentation: hands-on design and making workshops are employed throughout the project to inform and shape development. Three large-scale case studies in different museums provide test beds for the real-world evaluation of meSch technology with the public and cultural heritage stakeholders. The ultimate goal of the project is to support the creation of an open community of cultural heritage institutions driving and sharing a new generation of physical/digital museum interactives. meSch is a EU FP7 Integrating Project involving 12 partners across Europe.